Next week's Xbox 360 game Crackdown 2 is connected to current Facebook game Chuck's Ducks 2. We knew that. Are you ready for what's next? Microsoft producer Justin Robey won't tell me what's next yet, but he's been showing me how the paths of Facebook gaming and Xbox 360 gaming — two of the world's favorite ways to play video games — are beginning to intersect. In March, we got the first connection: Facebook game Match Defense: Toy Soldiers and Xbox 360 game Toy Soldiers syncing together. Scoring points in either game could add support in a third game, a virtual World War I waged between two factions of Toy Soldiers gamers. The Facebook game and the Xbox 360 game cross over, making players of both participants in a a third meta-game. In June, we've seen the second connection: Players of the balloon-popping Chuck's Ducks 2 on Facebook earn points that unlock special grenades accessible in the multiplayer modes of Crackdown 2. The Facebook players earn those grenades for themselves or any of their Facebook friends who have linked their accounts to Xbox Live. Get that? The Facebook players earn Xbox 360 game items for themselves and/or their Xbox 360-owning Facebook friends. Or let's put that another way: Grandma on Facebook can get you your Crackdown 2 grenades, without turning on an Xbox. Microsoft, which is making these Facebook games is serious about connecting the gaming experience on the Facebook network with Xbox Live. Why? From Robey's perspective, the Facebook games are "all about inclusive recreation, about getting family members to help with a game you're playing." The Facebook connections also allow an Xbox 360 owner to partially satisfy their Xbox 360 appetite when they are, say, at work on their computer. Can't play Crackdown 2? 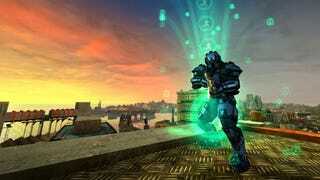 Play the Chuck's Ducks game to help your Crackdown 2 character. I've spoken to Robey a couple of times this year about Microsoft's efforts to cross Facebook gaming with Xbox 360 gaming. He produced Match Defense and Chuck's Ducks 2 and I'm sure he still has more work to do. He tells me to keep on imagining all that is possible. I tell him I'm imagining a war game where the Xbox 360 gamers fight it out, while the Facebook gamers handle the supplies, make the ammo and do other things far from the fighting front. He ain't talking. I won't be surprised if I hear from Robey again. Facebook gaming and Xbox 360 gaming — they just might get along. Imagine that.